This page is for artist printed images, framed and glazed prints, those in large mounts and also original artworks. 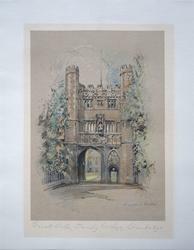 They will include etchings, aquatints, lithographs, woodcuts and engravings on wood, copper and steel and also drawings, watercolours and oil paintings. Note: the headline dimensions are the overall dimensions of frame or mount as applicable. BIG PRICE REDUCTIONS TO ALMOST EVERY ITEM IN THIS SECTION, SOME AS MUCH AS 50% OFF! Some of the photographs of glazed items show reflections and stray colours for which I apologise! 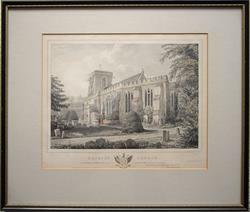 Artists include: FREDERICK CHRISTIAN LEWIS SNR (1779-1856), was an eminent painter, etcher, aquatint and stipple engraver. Lewis transformed numerous natural history paintings into aquatints. His superlative skills as an engraver led to frequent commissions from Royalty, and to his contribution to J. M. W. Turner's Liber Studiorum, a collection of seventy-one etchings with mezzotint, which greatly influenced landscape painting. Apart from the River Dart volume he produced a similar volume on the Exe. 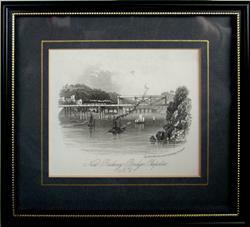 As the frames have been scratched buyers may prefer to have the etchings sent in their mounts alone. Postage costs will then be reduced. 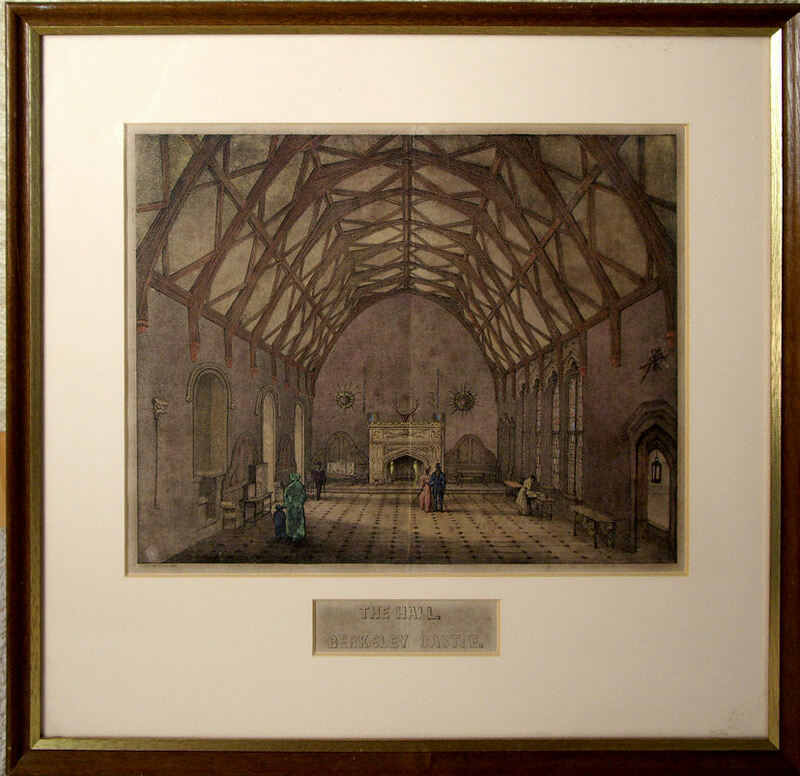 None of these etchings have been examined out of the frames. ROBERT HILLS (1769-1844). English Painter & Etcher. He exhibited six or seven drawings annually at the Royal Academy and was a member of the Society of Water-colours. His favourite subjects were cattle, sheep, donkeys, pigs, horses and above all deer. The British Museum holds the artist's collection of his own etchings, over 1200 of the finest impressions and proofs. HERBERT RAILTON. (1857-1910). I have added a score of the ORIGINAL SIGNED ARTWORK DRAWINGS in pen & ink on card by Herbert Railton for: EDINBURGH - A Historical and Topographical Account of the City, Written by M. G. Williamson. Methuen, 1906. After his drawings of a railway accident at Blackburn station (1881) were published in the Illustrated Sporting and Dramatic News, Railton went on to become one of the leading illustrators of his day. Railton provided many black and white illustrations for magazines and books - including editions of books by famous authors such Oliver Goldsmith, Henry Fielding, Samuel Johnson and travel guides, such as Coaching Days and Coaching Ways. Despite my best efforts, the images of these Railton drawings do not adequately show the contrast between the black ink and the white board. The list of 218 items in category ORIGINAL ART & FRAMED PRINTS has been split into 5 sections. This is section 1. Overall this panel is 1500mm (approximately 4 feet 6 inches) wide and 180mm (7 inches) high. It is carved in a harder wood (cherry?) and backed onto a softer fruitwood, possibly pear. Antique nineteenth century carved fruitwood marriage bed pediment, probably French and from a pair of farming families. This delightful panel is beautifully carved with a ram and a sheep beneath a garland of vines bearing bunches of grapes and surmounted by a star. On either side of this central relief are large flower heads and, stretching to the extremities of the panel, are garlands. The one on the left is of oak leaves and acorns and that on the right, possibly the arbutus or strawberry tree. A central scroll is dated 1887 with initials V N ET M A. The item has suffered from worming in the past as may be seen to a limited extent on the front but mainly in the softer backing wood. This is a wonderful interior design object and will make a delightful present on the occasion of a marriage or anniversary and will look good on the wall of a farm, small-holding or in the most chic of city lofts or apartments! 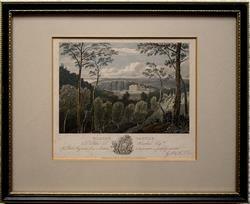 Original etching signed in pencil by the artist, Robert Houston. 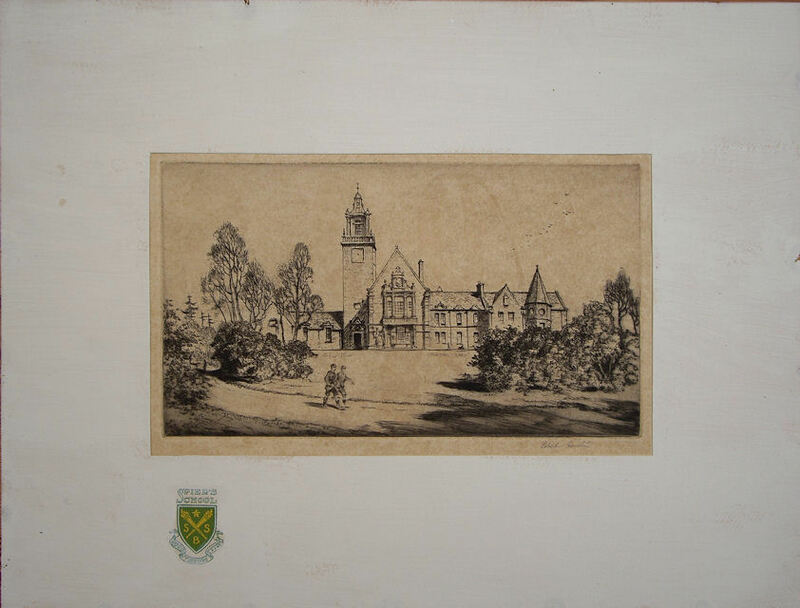 The etching is heavily toned (see image) and in a vintage mount with a window 255 x 150mm. On the mount is the School’s crest but rest of the surface of the mount appears to have been covered with a white wash. The school was closed in 1972. Steel engraved antique print with recent hand colour. Engraved by H. W. Bond after pictures by J. P. Neale, published in Jones' Views of the Seats ..., 1829. Gilt f rame with bevelled mount. Hand ruled wash line. Mount window 130 x 100 mm. Frame 240 x 215 mm overall. Looks to be in good condition but not examined out of the frame. Views of Berkeley Castle. Taken on the Spot and drawn on Stone, by Mr. H. Marklove. December, 1840. 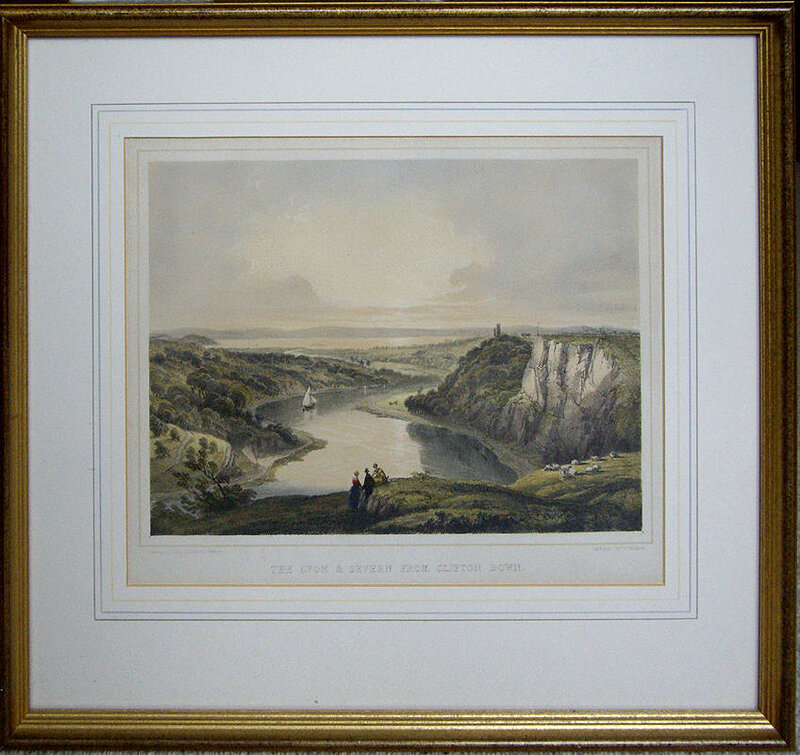 Hand coloured lithograph delin: H. Marklove; A. Pocock, Lithographer, Bristol. Framed and glazed in a quality wood frame, gilt. 560 x 455 mm; mount window 380 x 270mm. Appears in good condition with paper lightly toned but not examined out of the frame. There are only three copies of the book shown on COPAC (The database of 90 UK and Irish academic, national & specialist library catalogues): The British Library, The Guildhall Library in London and Oxford University. I cannot find any other original antique examples of this print for sale. Delin: H. Marklove from Views of Berkeley Castle. Taken on the Spot and drawn on Stone, by Mr. H. Marklove. December, 1840. 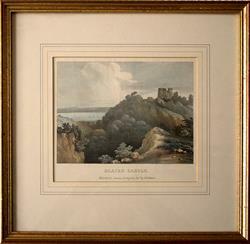 Hand coloured lithograph framed and glazed in a quality wood frame, gilt. 455 x 430 mm; mount window 315 x 250mm. Appears in good condition with paper toned but not examined out of the frame. There are only three copies of the book shown on COPAC (The database of 90 UK and Irish academic, national & specialist library catalogues): The British Library, The Guildhall Library in London and Oxford University. 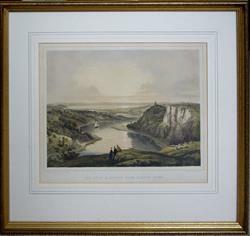 I cannot find any other original antique examples of this print for sale. 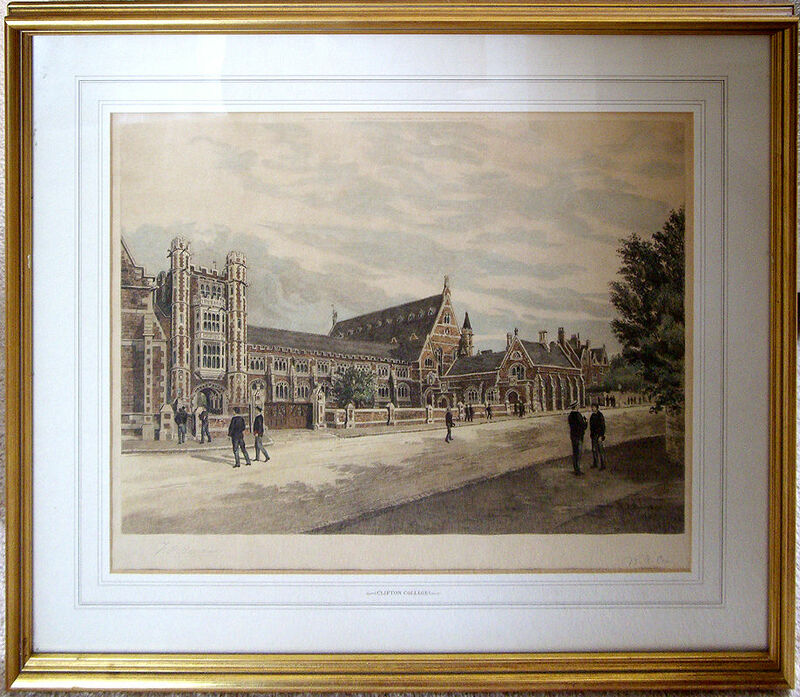 Original multi-stone colour lithograph by W. Walton printed by M & N Hanhart, lithographers after the artist F. W. Hulme. In a Hogarth frame, glazed. Produced for Samuel Carter Hall's The Baronial Halls and Picturesque Edifices of England published by Willis & Sotheran, 136 Strand, London, W.C. The print is on heavy paper, with a 27 x 20 cm mount window, including the captions. Appears in excellent condition. Frederick William Hulme (1816-1884) was an English landscape painter and illustrator born in Swinton in Yorkshire. The artist's mother was a porcelain painter who inspired and taught her son his first lessons in art. Hulme is well known for illustrating a number of books including the works of Edgar Allan Poe as well as S. C. Hall. Hulme was primarily known for his landscapes of Surrey and Wales, their brightness and precision. Bordeaux. 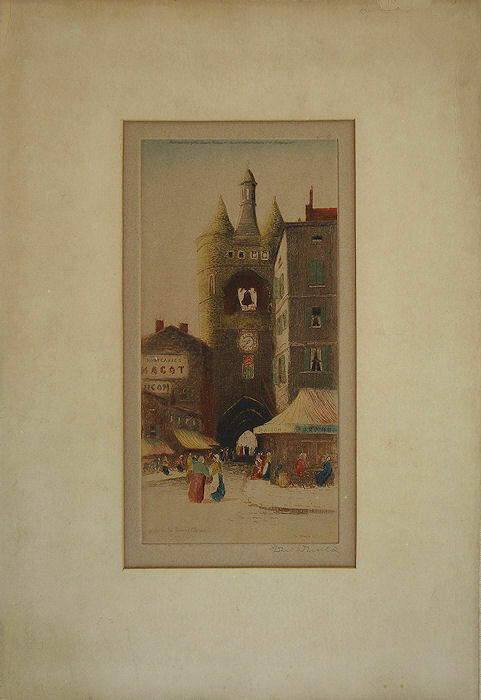 La Porte de la Grosse Cloche, St Eloi. Coloured etching, signed in the plate and in pencil by the artist, D. Donald. Published in 1923 by the Museum Galleries, Museum Street, London W. C. Laid down and in original bevelled mount which is somewhat toned. Mount window 145 x 280mm. In good overall condition with just a slight fault on the upper advert, (see image). On offer elsewhere at £95. W Harvey, del. From a sketch by S T Davis, T A Prior, sc. This original steel engraving with later hand colour is in a grey-green bevelled mount within a gilt frame. Mount window 225 x 165 mm; frame 400 x 355 mm overall. Appears in very good condition but not examined out of the frame. Please see images. 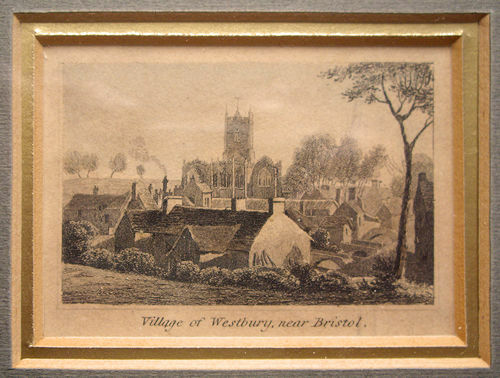 Village of Westbury (on Trym), near Bristol. 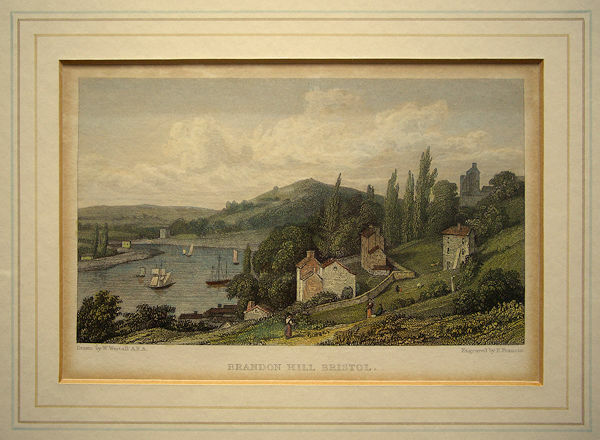 Copper engraving dating from 1823 - warranted by the Bristol gallery in 1982. Surprisingly detailed with the church, many cottages and three bridges over the river. It is in a Hogarth frame (with a few small chips) and dual bevelled mounts in grey and gold. Mount window 70 x 50 mm; frame 190 x 155 mm overall. Print appears in fair condition but it is toned. Not examined out of the frame. Please see images. The Seat of Sir John Smyth. For John Rutter s Delineations of Somersetshire, 1829. Pl. 10 From a drawing by J C Butler. Page 11 of the Delineations. 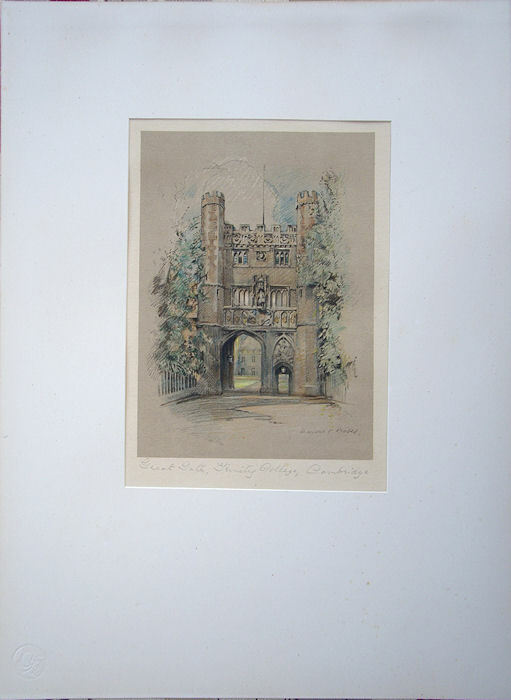 Published in lithography by J Rutter Shaftesbury. 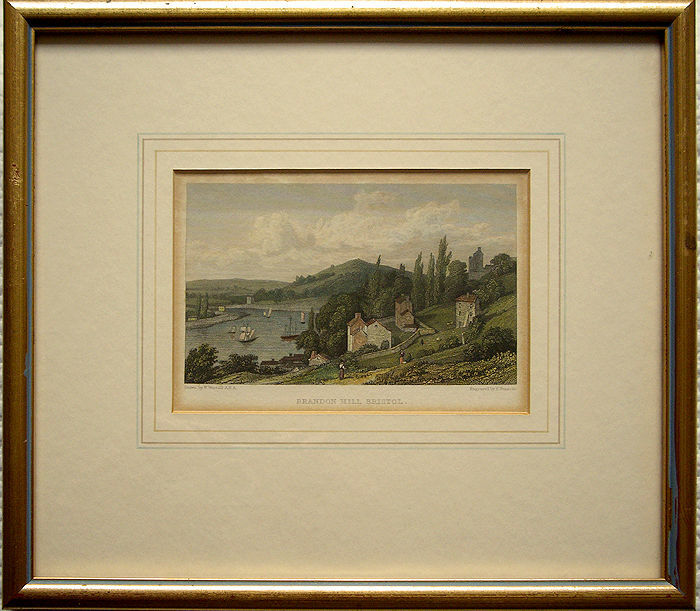 This hand coloured lithograph is in a gilt frame in a bevelled ivory mount with gold ruling. Mount window size: 175 x 125 mm. Frame overall: 290 x 250 mm. Print appears in good condition but there is a little toning in the margins and the sky. Not examined out of the frame. Drawn by M H Holmes. E T Dolby, Lith. Clerk & Co., Lithrs. 202 High Holborn. This lithograph probably dates from the 1840s and is subtly coloured. 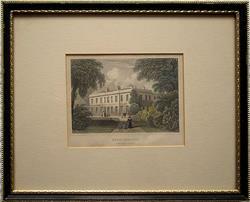 It is in a Hogarth frame (slightly chipped) and a grey-green bevelled mount. Mount window 310 x 240 mm; frame 420 x 360 mm overall. Print appears in very good condition but not examined out of the frame. Please see images. A fine original hand coloured antique engraved print titled: Blaise Castle, with coat of arms beneath. To John J Harford, Esq. This Plate Engraved from a Picture in his possession is gratefully inscribed by J & H S Storer. Published by Sherwood, Jones & Co., Paternoster Row. June 1 1825. It is in a Hogarth frame and a bevelled mount. Mount window 155 x 130 mm; frame 270 x 220 mm overall. Print appears in very good condition save for some faint spotting beneath the inscription. Not examined out of the frame. Please see images. Bristol. Blaise Hamlet: The Nine Cottages. 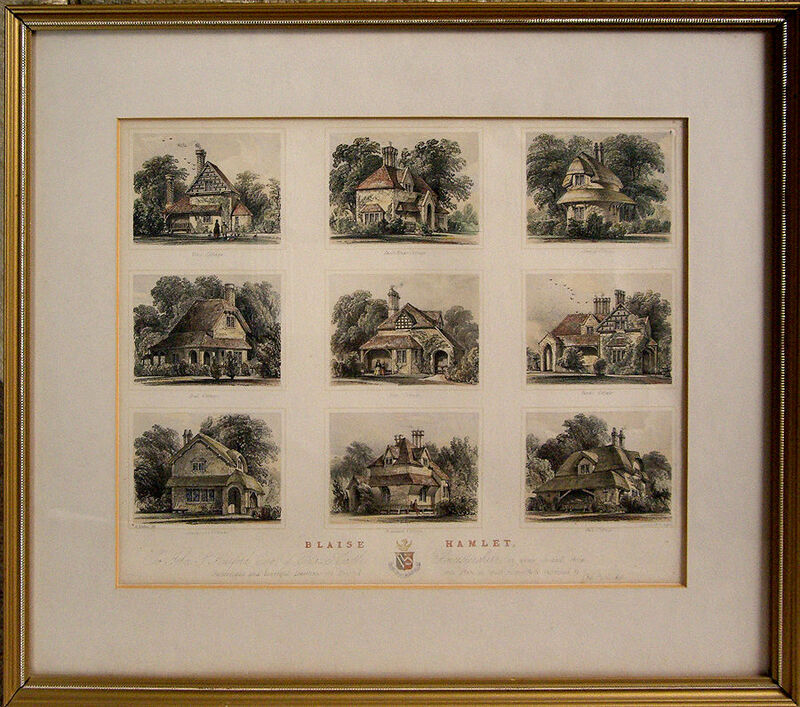 The nine cottages that make up Blaise Hamlet (now National Trust) in separate and distinct images with the names of the cottages. 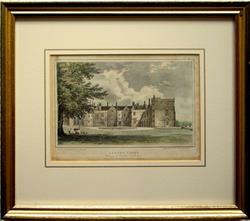 They are in fine original colour and the print is set in a bevelled ivory mount within a gilt frame, glazed. 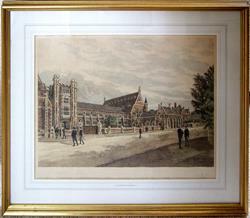 Antique hand coloured lithograph framed and glazed. SCARCE. 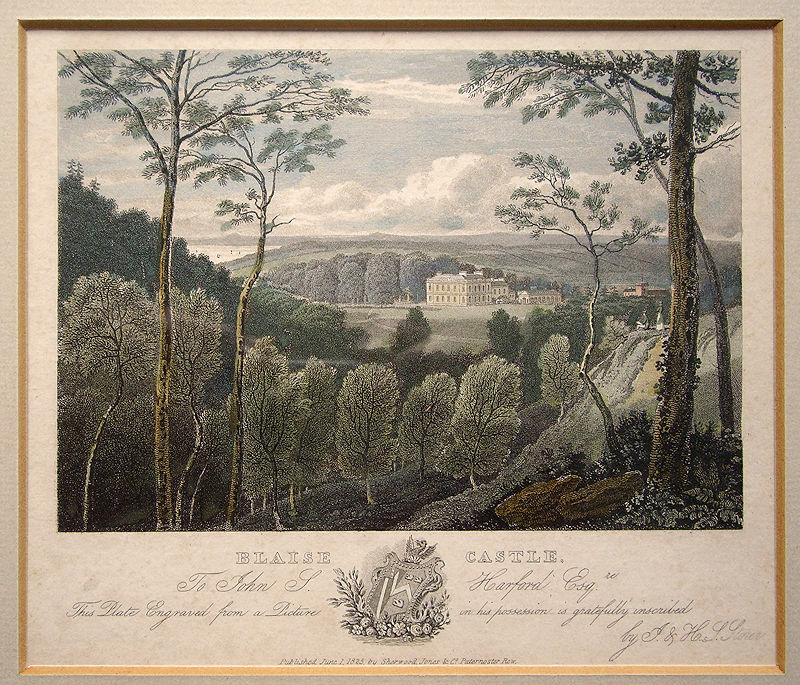 Inscribed Blaise Hamlet, to John S Harford of Blaise Castle, Gloucestershire in whose Grounds these Picturesque and beautiful dwellings are Erected this Plate is most respectively inscribed by The Publisher. Print window 305 x 240 mm; frame 425 x 360 mm overall. No date but believed to be c1840. Appears in very good condition save for slight fading of the script but not examined out of the frame. Louis Haghe and William Day were the most famous Victorian firm of lithographic printing in London. They pioneered the new techniques for chromolithography as well as hand-tinted lithographs. In 1838, Day and Haghe were appointed 'Lithographers to the Queen'. After William's death in 1845, the firm became known as 'Day & Son'. 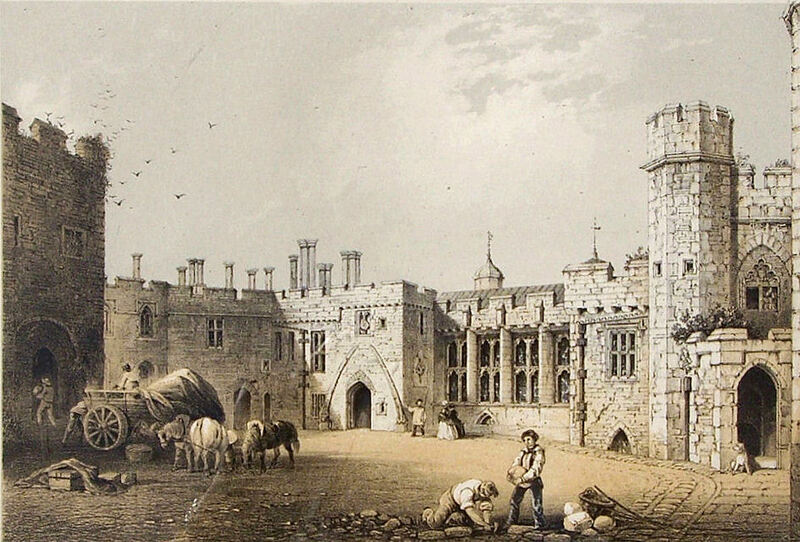 George Hawkins II (1809 - 1852) was a British lithographer and architectural draughtsman. 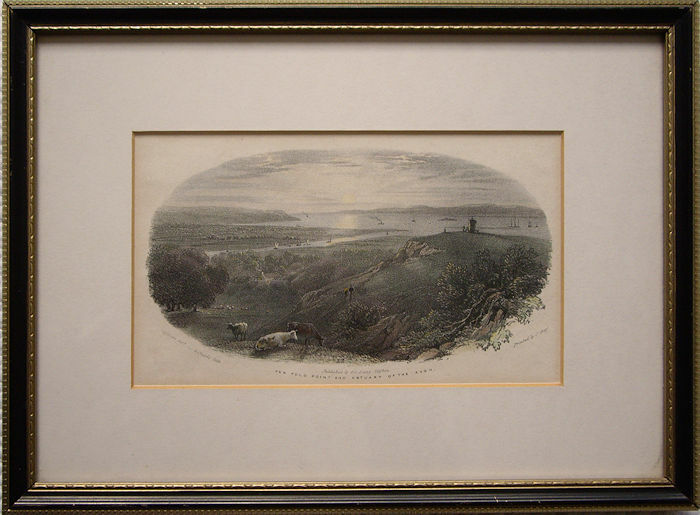 He was the son of the landscape painter and engraver George Hawkins I. First edition lithograph. G. Hawkins lithr; Day and Haghe, lithogrs to the Queen. Published by George Davey, Bookseller, Broad St. Bristol. 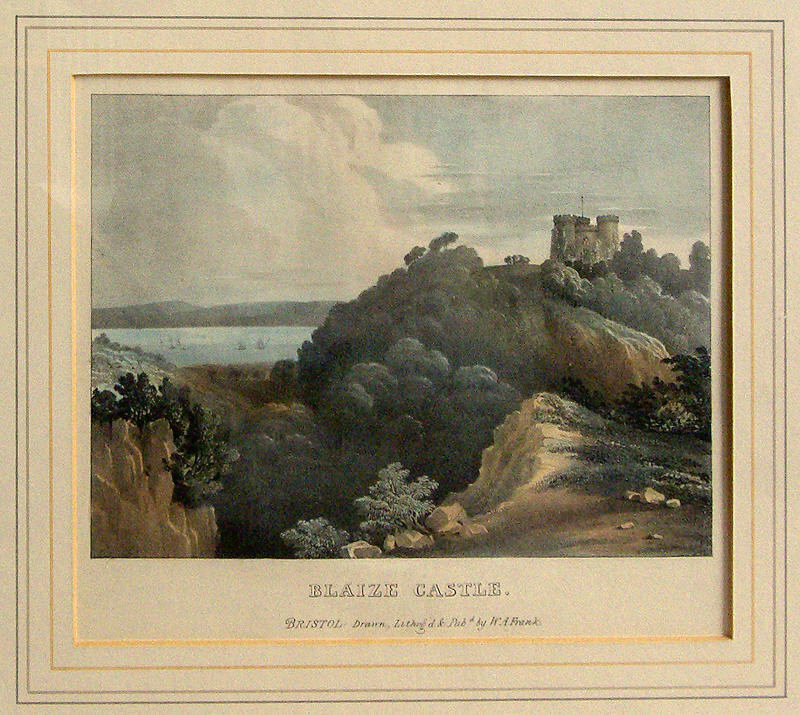 Antique images of Blaise Castle, rather than the mansion, seem to be very rare. Collections, both private and public, reveal almost none. Searching the Bristol Museum collection found only one. Undated, it is certainly early nineteenth century and could be from the beginning of that century. I cannot find any reference to W A Frank on the internet. This particular image is a really striking one in the picturesque manner with vibrant colours. Drawn, lithographed and printed by W A Frank. In a gilt frame with a mount with multiple hand rulings. Mount window 245 x 200 mm; frame 430 x 405 mm overall. Appears in very good condition but not examined out of the frame. Please see images. Hand coloured engraving. Originally produced for the part-work series Great Britain Illustrated (1828-1830), published by Charles Tilt. Engraved by Edward Francis from an original drawing by William Westall, A.R.A. Steel engraving on paper. Later hand colour. In a gilt frame and an ivory bevelled mount with rulings in colours and gold. Mount window 155 x 100 mm; frame 295 x 255 mm overall. Print appears in very good condition save for light matt burn but not examined out of the frame. Please see images. Drawn on stone by R Haghe. J Willis, Deld. Day & Haghe lithrs to the King, London. To Edward Sampson Esqre of Henbury, Gloucestershire, This plate is most respectfully dedicated by The Publisher. Publisher: George Davey, 1 Broad Street, Bristol. It is in a Hogarth frame and a bevelled ivory mount. Mount window 280 x 225 mm; frame 420 x 355 mm overall. Print appears in good condition but there is a little toning in the margins. Not examined out of the frame. Please see images. Titled in pencil. Largely monochrome lithograph (clothing of the three adults with a child is subtly tinted); published by George Davey, 1 Broad Street, Bristol. It is in a Hogarth frame (with a few small chips) and a bevelled ivory mount. Mount window 290 x 205 mm is limited to the printed image only plus the narrow blank lower margin that is within a printed ruling on copies of this print; frame 425 x 375 mm overall. Print appears in good condition. 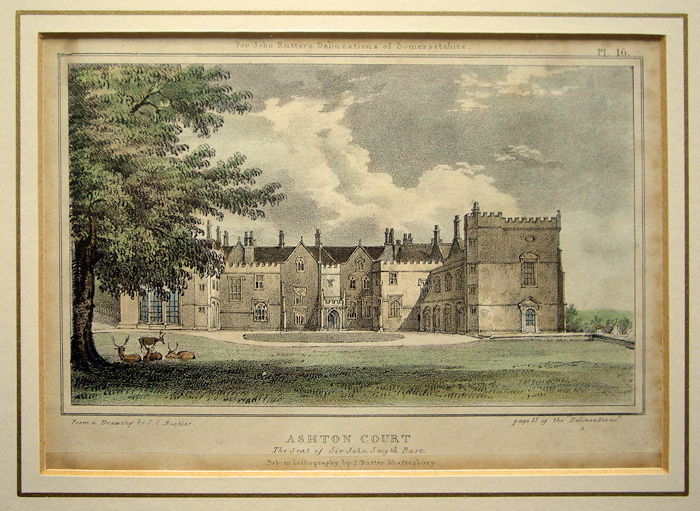 The panel with the dedication is not in view: To Edward Sampson Esqre of Henbury, Gloucestershire, This plate is most respectfully dedicated by The Publisher. It may not still be attached. Not examined out of the frame. Please see images. 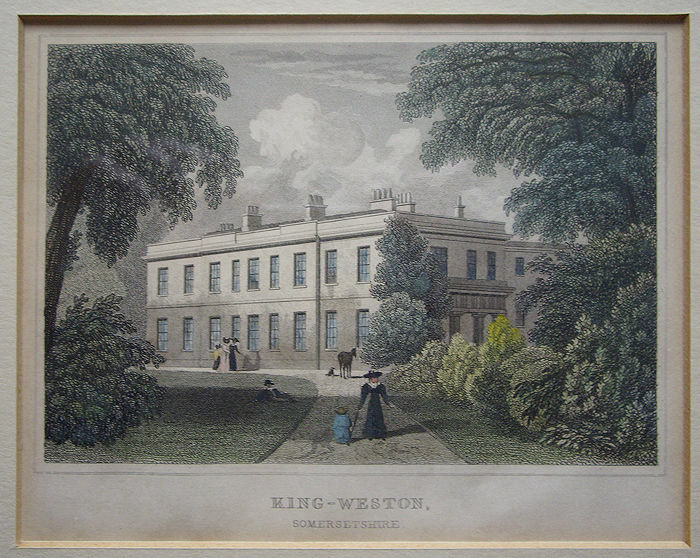 King-Weston Antique steel engraving, 1828. From a drawing by John Preston Neale, engraved by T Jeavons and published by J P Neale. Subtly coloured. It is in a Hogarth frame with a bevelled ivory mount. Mount window 130 x 105 mm; frame 270 x 220 mm overall. Print appears in good condition but it is a little toned especially around the margins. Not examined out of the frame. Please see images. 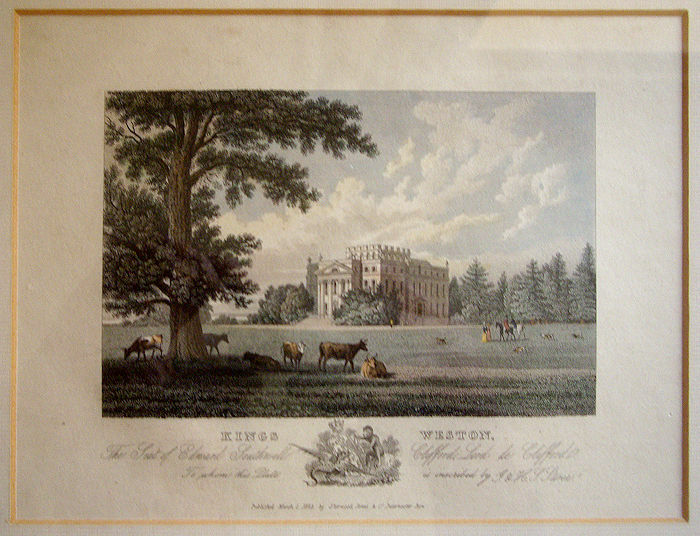 A fine original hand coloured antique engraved print titled: Kings Weston, with coat of arms beneath. 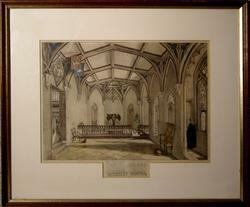 The Seat of Edward Southwell Clifford, Lord de Clifford .To whom this Plate is inscribed by J & H S Storer. Published by Sherwood, Jones & Co., Paternoster Row, March 1 1825. It is in a Hogarth frame and a bevelled mount. Mount window 200 x 150 mm; frame 350 x 310 mm overall. Print appears in very good condition but not examined out of the frame. Please see images. 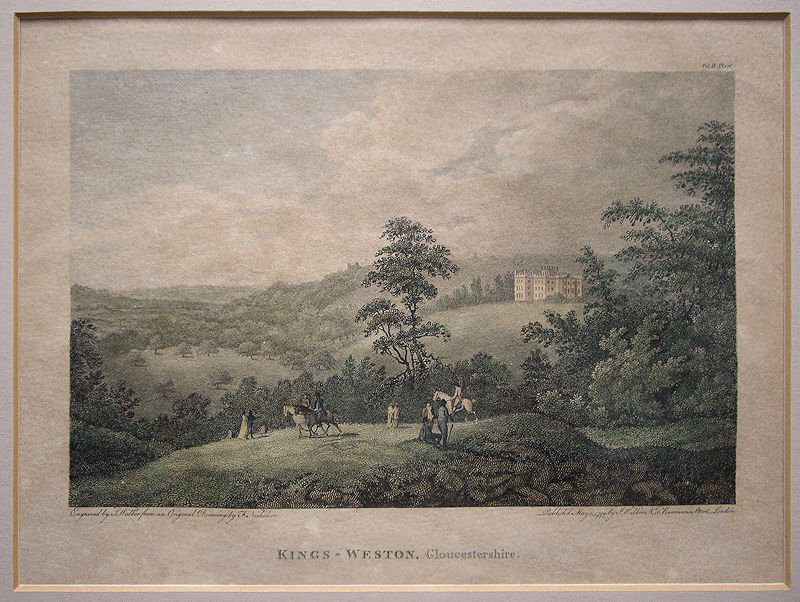 A fine original hand coloured antique copper engraved print titled: Kings Weston, Gloucestershire. 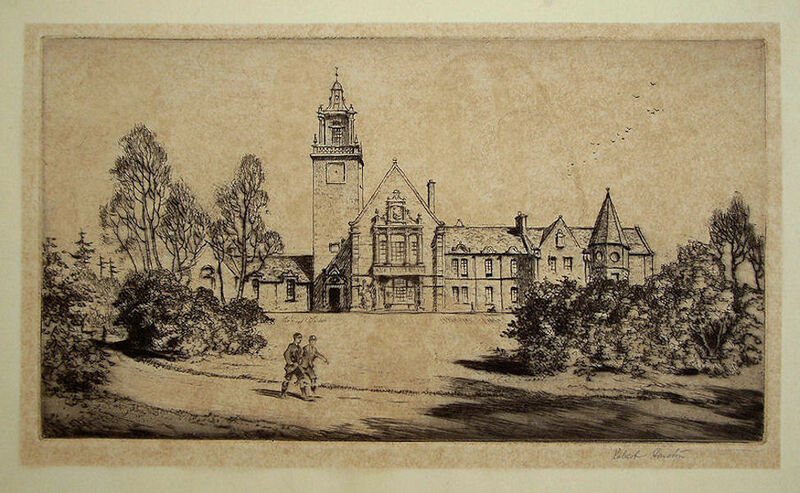 Engraved by J Walker from an original drawing by F Nicholson. Published by J Walker, 16 Rosoman Street, London. May 1 1799. 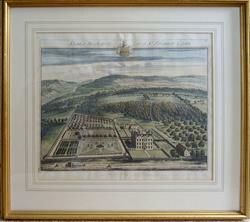 It is in a gilt frame and a bevelled mount. Mount window 195 x 145 mm; frame 310 x 260 mm overall. Print appears in good condition but paper is a little toned. Not examined out of the frame. Please see images. Bristol. Nightingale Valley near Clifton, Leigh Woods. 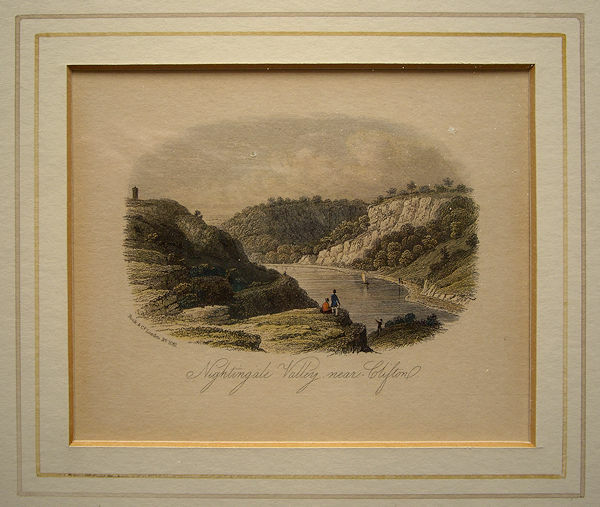 Visitors look out over the Avon Gorge towards Leigh Woods and Nightingale Valley just downstream of the point from which the Clifton suspension bridge now passes over the river Avon. The Observatory on Clifton Down is seen at the far left. After H. Holmes. Rock & Co., London. (1821-1833). No.1061. 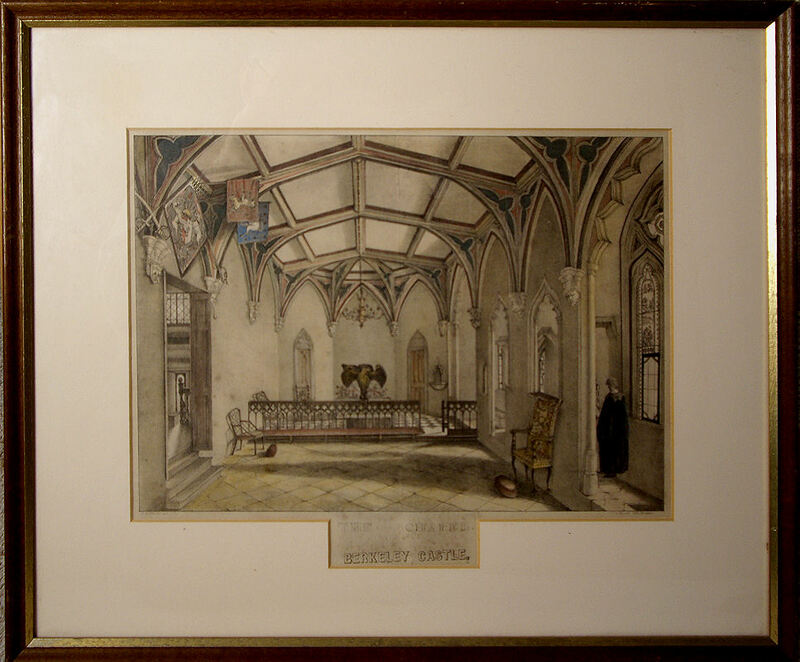 This hand coloured steel engraving is in a gilt frame with a bevelled ivory mount with twin hand rulings. Mount window size: 115 x 95 mm. Frame overall: 285 x 275 mm. 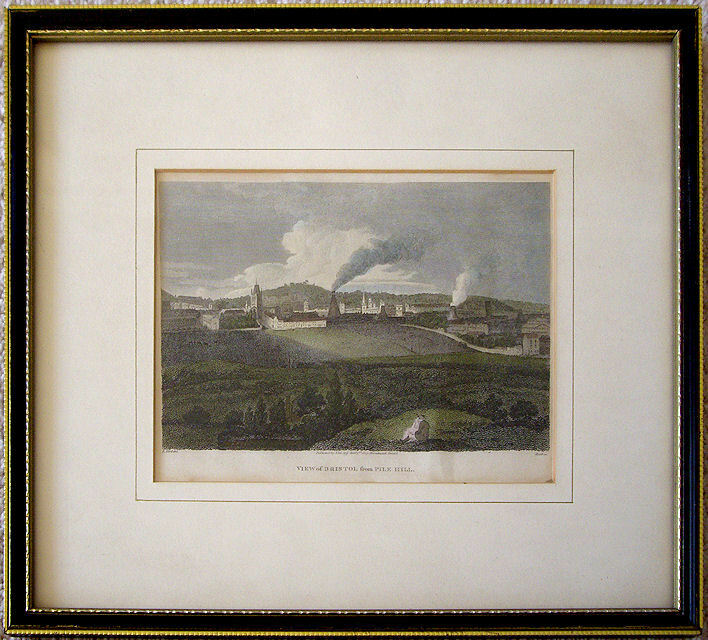 Print appears in very good condition but not examined out of the frame. Pen Pold (Pole) Point and Estuary of the Avon. c1840. Jackson, deld.. G Childs, lith. Printed by J Graf. Published by O C Lane, Clifton. This coloured lithograph is in a Hogarth frame with a bevelled ivory mount. Mount window 185 x 110 mm; frame 295 x 220 mm overall. Print appears in a very good condition. Not examined out of the frame. Please see images. 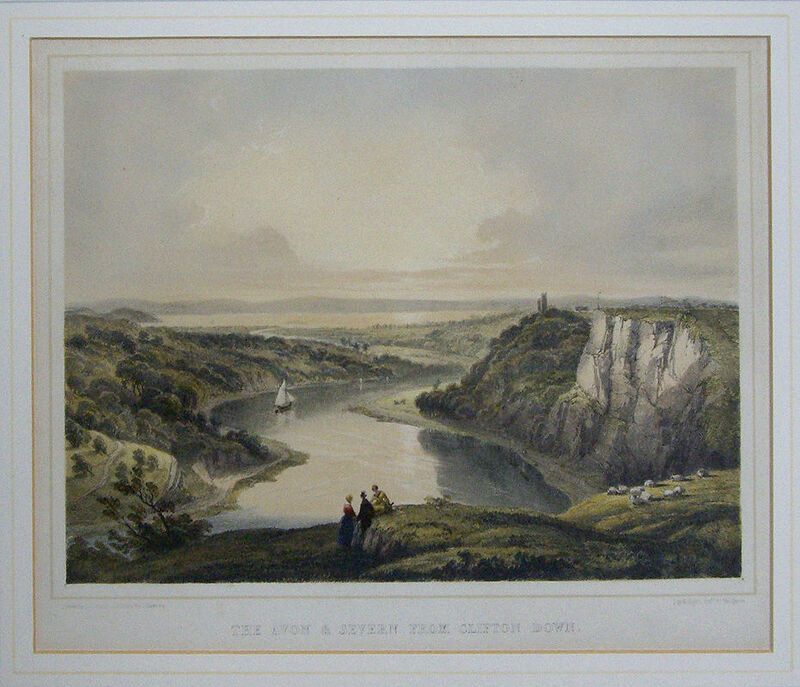 Avon Gorge. St Vincent s Rocks from Sea Walls Original antique coloured framed lithograph dating from around 1845. Scarce. Lithographed on stone by Wm Gauci. Printed by Graf & Soret. In a wood frame, gilt, in a mount with a single gilt hand ruling. Mount window 215 x 150 mm; frame 340 x 285 mm overall. Appears in very good condition but not examined out of the frame. Please see images. Bristol. The Avon and Severn from Clifton Down. Large antique coloured lithograph. A fine view and a rare item. I have not found any references to this lithograph. Drawn by S C Jones - On stone by G Hawkins. Day & Haghe, Lithrs to the Queen. In a gilt frame with a bevelled mount having triple hand rulings in three colours. Mount window 320 x 250 mm; Frame overall 470 x 415 mm. Looks to be in very good condition but not examined out of the frame. Bristol. The Rivers Avon & Severn from Pen Pole Point, Kings Weston Park. Strollers watch the ships on the rivers at their confluence from the Compass Dial on Penpole Hill. After H. Holmes. Rock & Co., London. (1821-1833). No.1062. 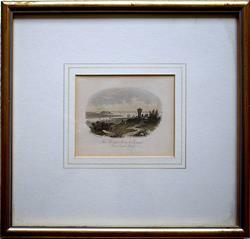 This hand coloured steel engraving is in a gilt frame with a bevelled ivory mount with twin hand rulings. Mount window size: 110 x 95 mm. Frame overall: 285 x 275 mm. Print appears in very good condition but not examined out of the frame. Published by John Agg, Broadmead, Bristol. Jan 2nd 1809. E Bird, del and Heath sc. 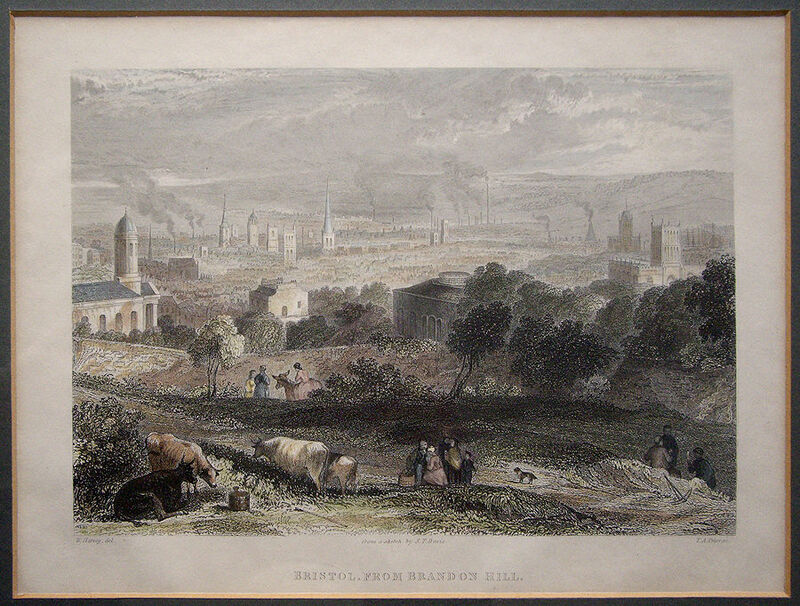 Bristol is seen from afar with St Mary Redcliffe to the left without its spire, several pottery kilns emitting smoke, etc. The print is in a Hogarth frame, glazed. The bevelled gold ruled ivory mount has a window size: 185 x 130mm, frame overall: 320 x 270mm. 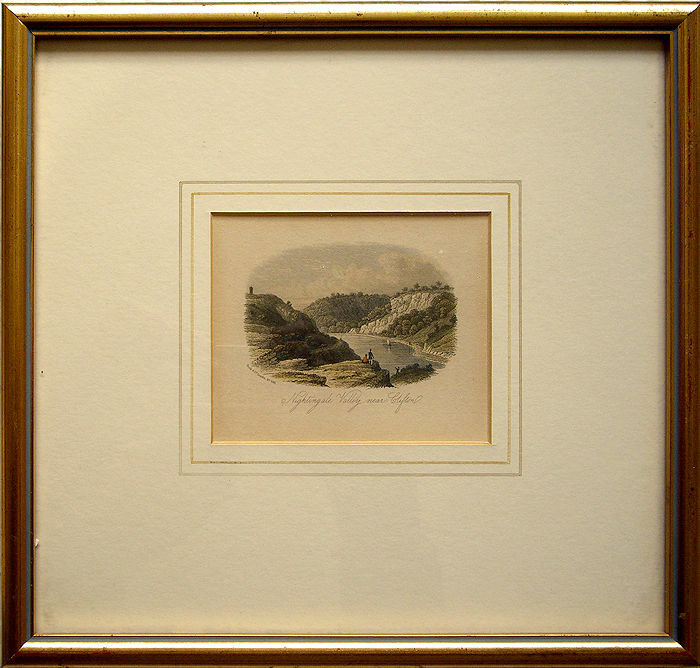 Appears in good condition except for very light toning at the edge of the mount window and paper not entirely flat near the lower right corner but not examined out of the frame. Drawn & lithd J Willis. Day & Haghe lithrs to the King, London. Publisher: George Davey, 1 Broad Street, Bristol. It is in a Hogarth frame and a bevelled ivory mount. Mount window 280 x 220 mm; frame 420 x 355 mm overall. Print appears in good condition but there is a little toning in the margins. Not examined out of the frame. Please see images. This plate is either from Britannia Illustrata: Curiously Engraven on 80 Copper Plates. 1709/1712 OR The Ancient and Present State of Glocestershire 1712, re-issued 1768. Robert Atkyns. Frame 645 x 580mm; engraved area 440 x 340mm. 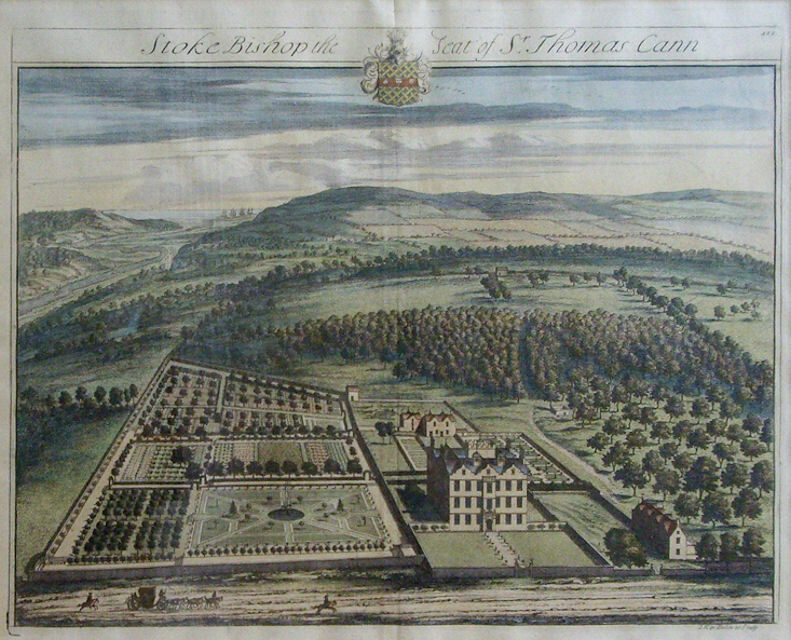 A splendid antique original copper engraving of a clean birds-eye view of Stoke Bishop, the Seat of Sir Thomas Cann showing the Hall, the formal gardens, the park, the farm and the surrounding countryside with the Bristol Channel in the distance. Coat of arms. Drawn and engraved by Jan Kip. Light centre fold. In a very nice gilt frame, glazed. Bevelled mount with four hand ruled lines. Robert Cann born c 1621, was a Bristol Merchant and twice mayor of Bristol in 1662 and 1675. Robert received the honour of knighthood from King Charles the Second on 22nd April 1662, then was given the baronetcy on the 13th September 1662. Robert built the house which was finished around 1669. His son William became the 2nd Baronet. The title then passed to a son, Sir Thomas Cann, by his third (?) wife, who held the office of Alderman of Bristol and was invested as a Knight on 18 April 1680. The last Baronet, Robert, died without issue in 1775. Chepstow, Monmouthshire. New Railway Bridge, No.1. Steel Vignette engraved & published by Newman & Co., Watling Street, London. 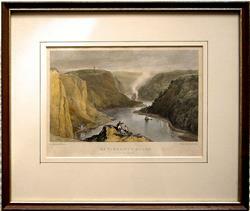 Shows a steam train crossing the bridge over the River Wye with a steam boat and several sailing vessels below. The Chepstow railway bridge was built by Isambard Kingdom Brunel in 1852. 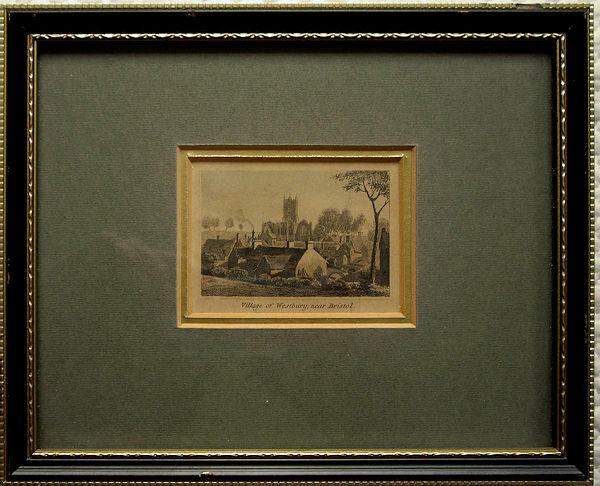 The engraving in a gilt-ruled bevelled charcoal mount in a gilt and black frame. Mount window size: 100 x 80mm, frame overall: 165 x 145mm. In very good condition. 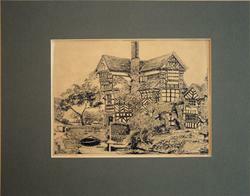 Original pen & ink drawing by Charles R Groves, signed. A 15th century half-timbered house now in the care of English Heritage. In a bevelled mid-grey mount. Mount window size: 200 x 150mm, mount overall: 315 x 250mm. In good condition, although the paper is toned. Clifton College. General View of School Buildings. A view of the buildings at Clifton College, Bristol. Pupils, senior and junior, seen walking around in the road outside. The only copies I have found for sale are uncoloured and unframed with foxing or creasing at 230- 360. 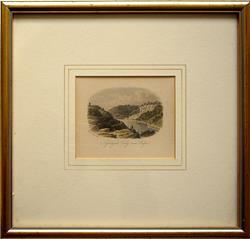 Hand coloured etching mounted within a gilt frame. Pencil signatures: F. P. Barraud (the artist) and W. A. Cox (the engraver). Etched in image: F. P. Barraud. London. Published Oct 7th 1891, by Messrs Dickinson & Foster, Publishers to The Queen. 114, New Bond Street, W. Mount window: 495 x 380 mm. Frame size: 675 x 555mm overall. 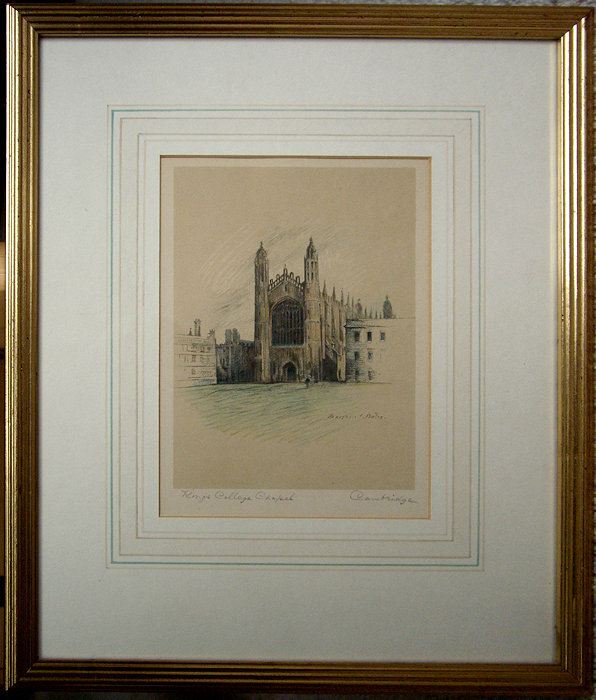 Specially commissioned multiple hand ruled bevelled mount with Clifton College printed below the etching. Print Sellers Association blind stamp at lower left corner. Looks to be in very good condition but not examined out of the frame. Henry G. Walker. Signed in Pencil. Cottage, cobbled stepped path, man with donkey chats with lady over her gate, cat sits beneath a laid table inside open cottage door; four yachts with sails in the harbour with a two masted ketch. Original coloured Soft Ground Etching. Paper somewhat toned. Framed and glazed. Bevelled mount with double gold hand ruling. Wooden frame 365 x 475 mm; engraved area 220 x 277 mm. Not examined out of frame. Henry George Walker, 1876-1932, was born in Birmingham and attended Birmingham Municipal School of Art between 1897 and 1901. He owned his own design studio in 1907 and produced many polychrome and monochrome etchings in the early 1920s. Gordon Ellis, signed and dated 1986. 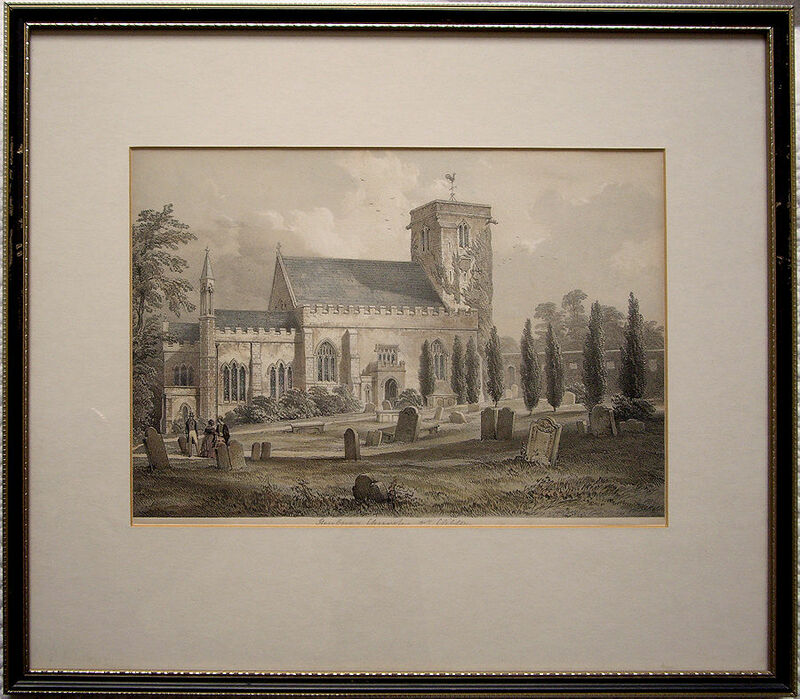 Original watercolour in a double bevelled mount. 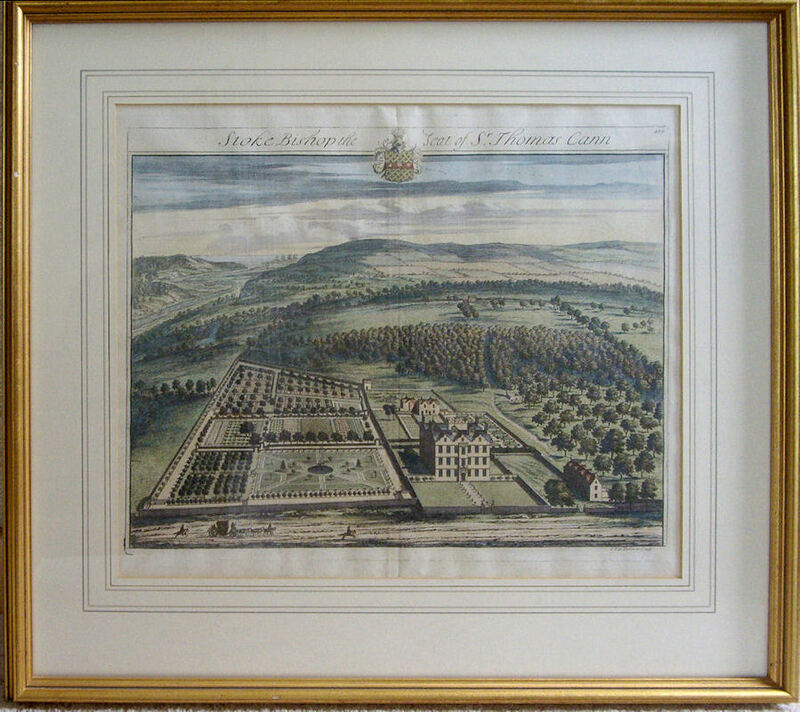 Mount window 495 x 395 mm; overall size including frame 630 x 530 mm. Hand coloured Victorian wood engraving in a bevel cut mount; framed and glazed. This is an original antique and its authenticity is guaranteed. It dates from around 1865 with later hand colouring. Appears in excellent condition but not examined out of the frame. The print window is 180 x 100mm. Note: The frame has one or two bumps. Denbighshire. Pont-Y-Cissyltte, in the Vale of Llangollen. This aqueduct 1007 feet in length carries the waters of the Ellesmere Canal over the River Dee. Image area 180 x 120 mm, mount overall 295 x 205 mm. Excellent condition save for one pinhole that is seen only when held to the light. Included in his Picturesque Scenery on the River Dart, Devon. In Thirty Five Plates and Three Vignettes, published in 1821. Please see the paragraph at the head of page one for details of this top quality artist. A view down the valley from the North. 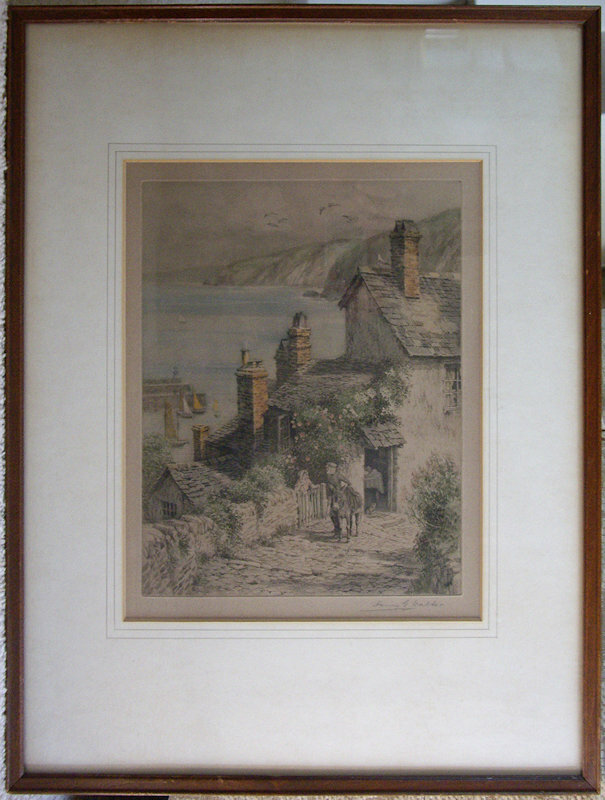 An original etching by Frederick Christian Lewis Snr. An Artist’s proof dated 1820. 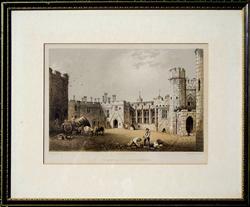 In a silvered frame with double bevelled mount and a separate title window below. 400 x 345 mm overall; mount window 255 x 195 mm. The frame is very chipped, see images. Can be sent at less expense just in its mount. A really beautiful and finely executed etching by this acknowledged master of the craft. In very clean condition. Devon: Fishing on the River Dart. A man fishes while a lady sketches. 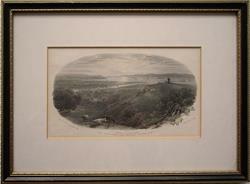 An original etching with aquatint by Frederick Christian Lewis Snr. In a silvered frame with a single bevelled mount. Indistinctly engraved on the plate: From a drawing by Emily Calmady. The British Museum confirms her as the artist behind plate 12. 400 x 345 mm overall; mount window 237 x 172 mm. Probably an artist’s proof from 1820. The frame is a little dented, see images. Can be sent at less expense just in its mount. 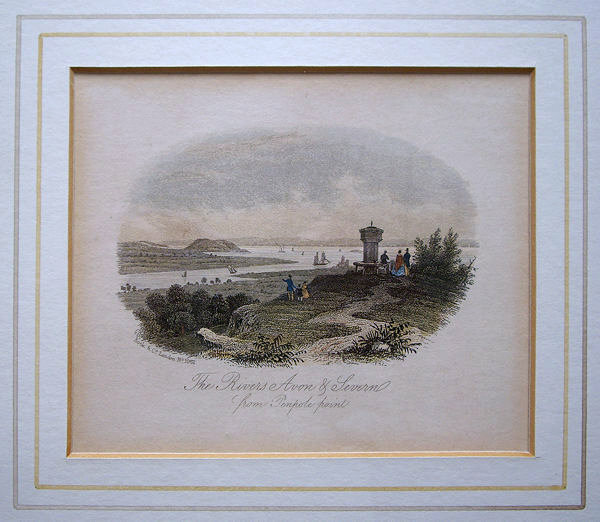 This is a superb aquatint by the master of the technique. A delightful image with subtle colouring. Devon: Holne Bridge on the River Dart. 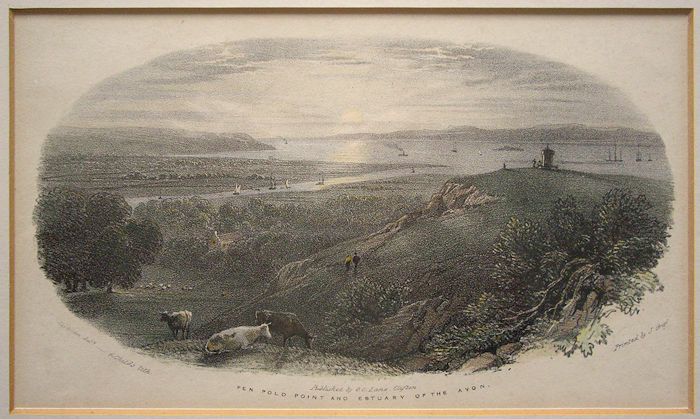 A pair on horseback ride over the bridge; the Dart placid below. 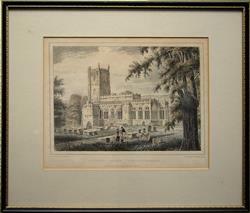 An original etching with aquatint by Frederick Christian Lewis Snr. 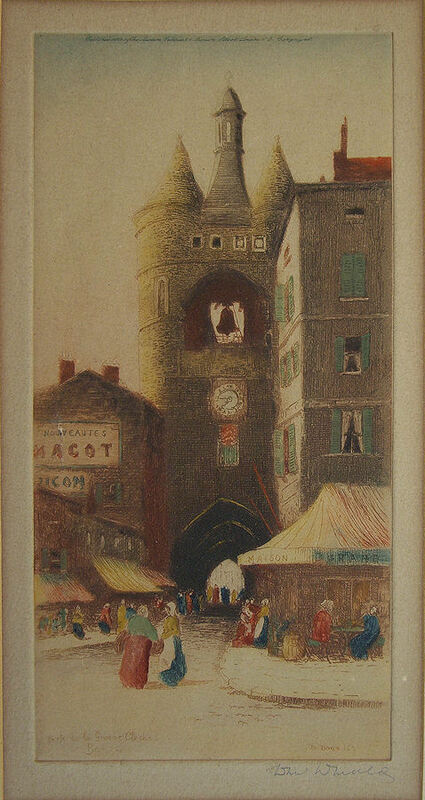 He was renowned for his skill with aquatint. 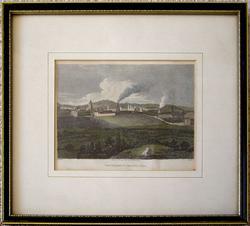 An Artist’s proof dated 1820. In a silvered frame with a single bevelled mount and a separate title window below. 400 x 345 mm overall; mount window 255 x 195 mm. The frame is a little dented, see images. Can be sent at less expense just in its mount. 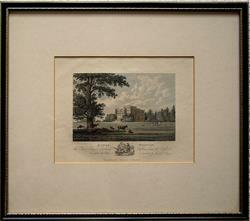 This is a superb aquatint by the master of the technique. A delightful image with subtle colouring. Devon: River Dart From W(h)istman s Wood with Two Bridges. Looking South on the uppermost reaches of the Dart. 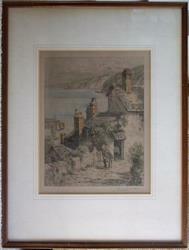 An original etching with aquatint by Frederick Christian Lewis Snr. He was renowned for his skill with aquatint. 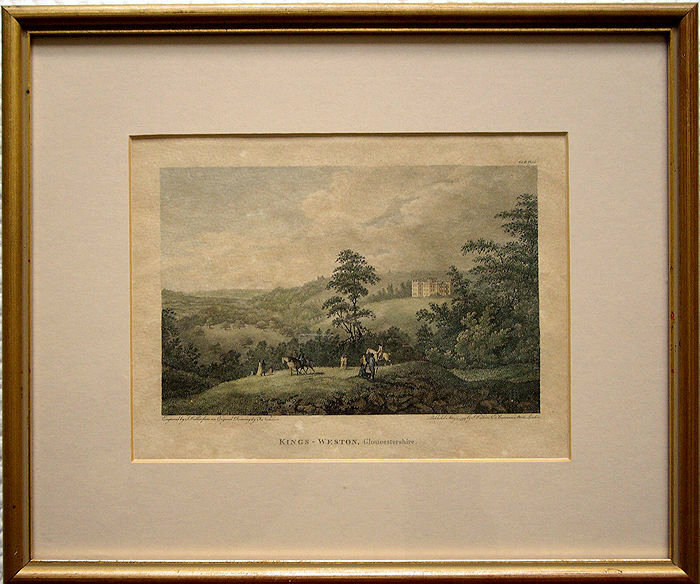 An Artist’s proof dated 1820. 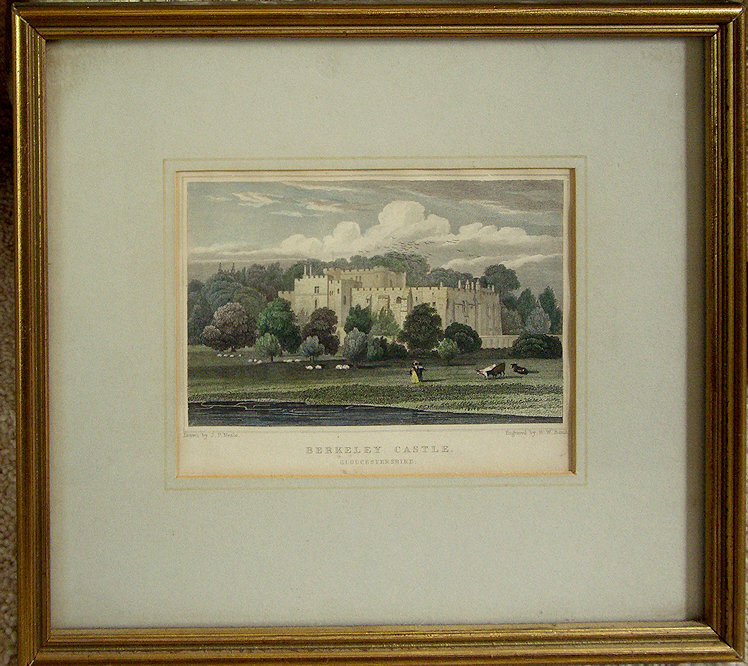 In a silvered frame with double bevelled mount and a separate title window below. 400 x 345 mm overall; mount window 255 x 195 mm. Paper a little toned and very slightly rippled. The frame has lost a little of the surface, see images. Can be sent at less expense just in its mount. The Dart snakes its way down from a boulder strewn hillside to Two Bridges in the distance. Devon: River Dart New Bridge from Spitchwick Cross. New Bridge connects Aish Tor to Holne Chase. 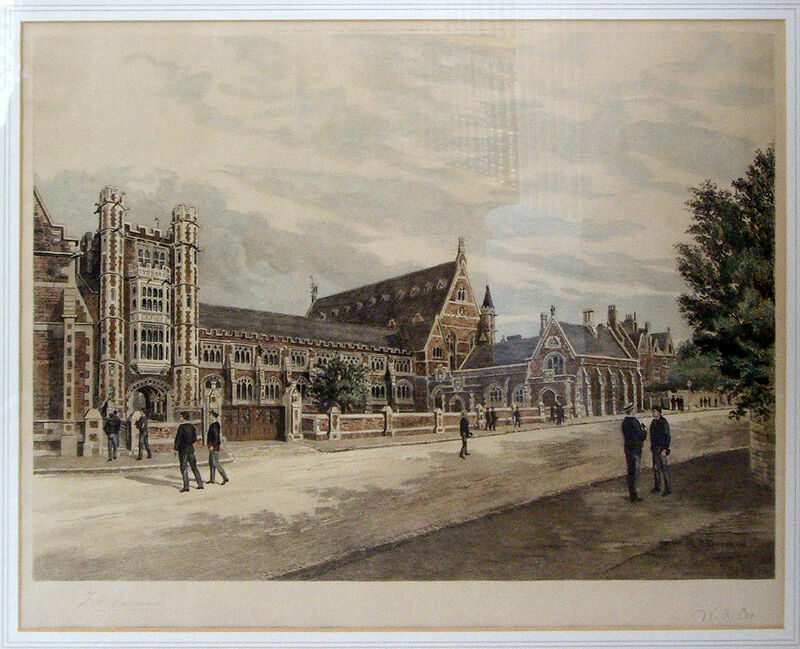 An original etching by Frederick Christian Lewis Snr. 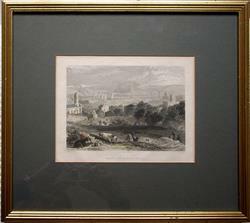 An Artist’s proof dated 1820. 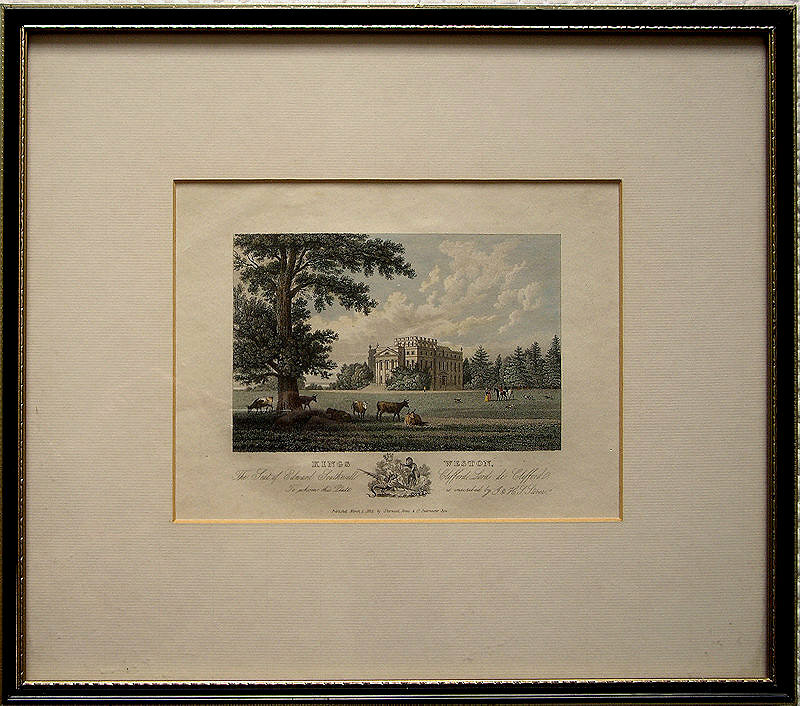 In a silvered frame with double bevelled mount and a separate title window below. 400 x 345 mm overall; mount window 255 x 195 mm. Paper a touch toned and ever so slightly rippled. The frame is a little rubbed, see images. Can be sent at less expense just in its mount. 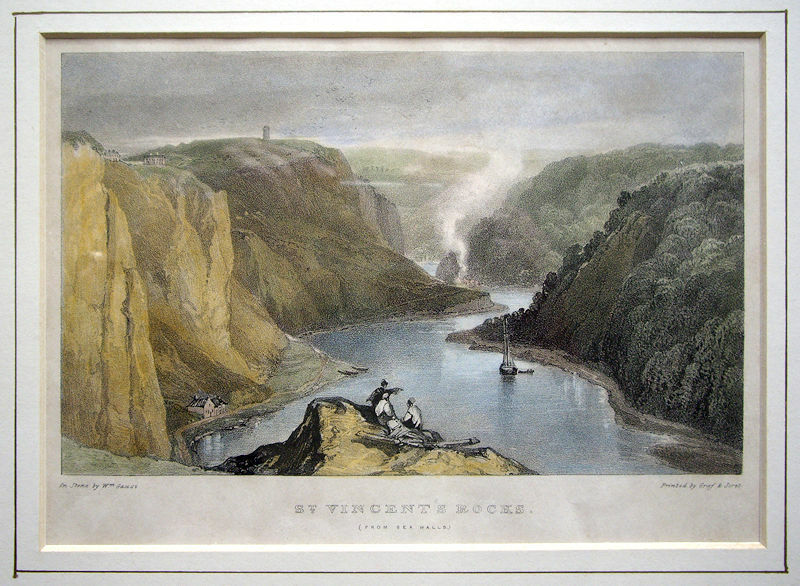 A fine etching of a tranquil pool on the Dart. Devon: River Dart New Bridge. New Bridge connects Aish Tor to Holne Chase. An original etching by Frederick Christian Lewis Snr. 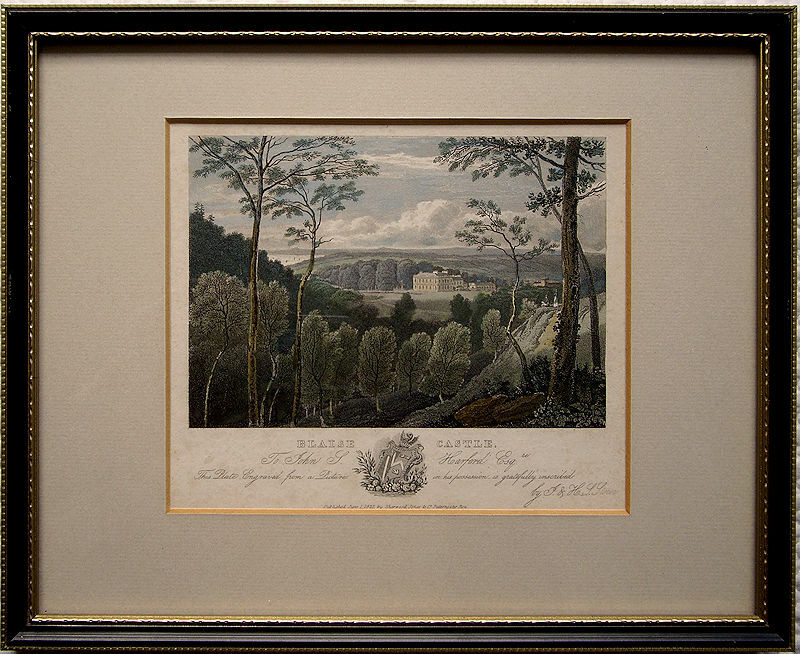 An Artist’s proof dated 1820. In a silvered frame with double bevelled mount and a separate title window below. 400 x 345 mm overall; mount window 255 x 195 mm. Paper a touch toned and slightly rippled. The frame is rather rubbed, see images. Can be sent at less expense just in its mount. A view through the arch of the rolling Devon hills. Devon: Scenery of the River Dart from Holne Cottage. The river can be seen emerging from the woods with Holne Bridge in the middle distance. 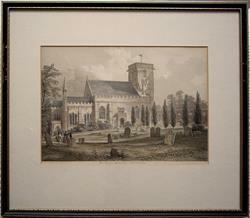 An original etching with aquatint by Frederick Christian Lewis Snr. 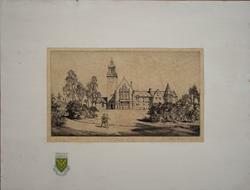 He was renowned for his skill with aquatint. 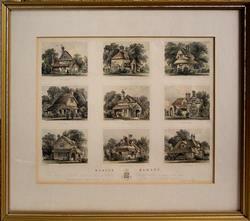 An Artist’s proof dated 1820. 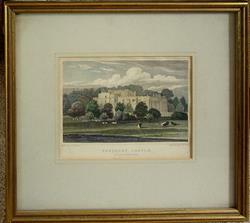 In a silvered frame with double bevelled mount and a separate title window below. 400 x 345 mm overall; mount window 255 x 195 mm. Paper a little toned and ever so slightly rippled. Small foxed spot in the sky. The frame is rather rubbed, see images. Can be sent at less expense just in its mount. A delightful view of the Dart threading its way through the Devon hills. Dickens. A Coaching Dream of Dickens; (Waiting for the Horses). Framed & glazed 745 x 495 mm overall; pseudo plate mark 500 x 350 mm. The frame is of classic solid oak and dates from the middle of the 20th century. Vintage print especially drawn by John W. Houghton, dated (19)11. Copyright by Frank Speaight, the celebrated English actor who regularly toured the United States as well as Canada and Australia with his novel entertainments. His 1931 US tour is described as his 20th US tour. He gave one man shows, many linked to Dickens. The picture is full of characters from Dickens’ novels. Drawing. Climbing. The Artist climbing the Pinnacles, Liathach in Torridon, Wester Ross. Original pencil drawing by V S Penfold, signed and dated 7/1990. Framed & glazed in a Hogarth style frame. Appears in good condition but not examined out of the frame. Overall 270 x 325 mm. Drawing. Climbing. Vic Penfold & Slim Reed of Sussex Mountaineering Federation on Beinn Eighe. Original pencil drawing by V S Penfold, signed and dated 8/1990. Framed & glazed in a Hogarth style frame. 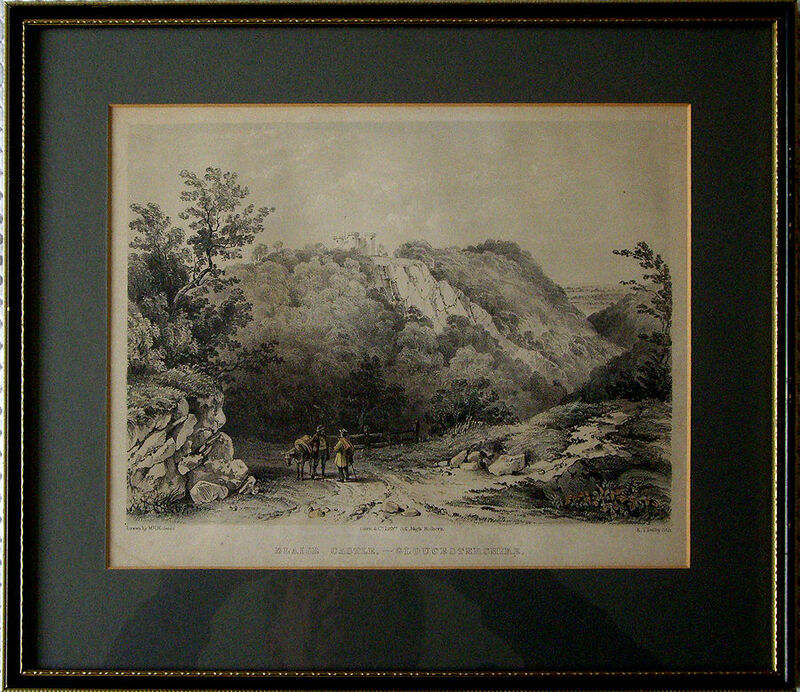 The mount is a little creased, see image, but otherwise appears in good condition but not examined out of the frame. Overall 270 x 325 mm. Original pencil sketch in a bevelled and hand ruled ivory mount. Signed and dated by the artist in pencil. Mount window 165 x 85 mm. The mount has a few faint spots.